St Mary's church sits at the lower end of the town on the sloping ground leading to the Hythe. Identified by its distinctive white steeple, the church spire was a welcoming beacon for sailors returning from the open sea as they sailed home up the river Blackwater. At night in times long past, it was lit by hanging a hanging beacon light referred to as the mariners beacon by sailors who used it a a navigational aid. The wooden shingled spire was not erected until 1740 but the beacon light was used for centuries before that from the tower. A church has existed on this site since Saxon days. The original wooden structure was probably destroyed during the first battle of Maldon in 917 at which King Edward the Elder defeated the Danes. After the Norman conquest in 1066 all the estates of the Saxon land owner Bishop Ingelric including the church were taken by Eustace, Count of Boulogne who was a brother-in-law of William the Conqueror. 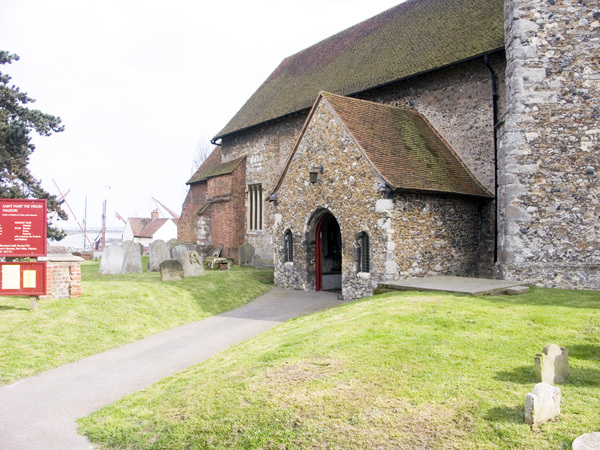 Saxon churches were rebuilt by Norman craftsmen after this period and it is recorded that the third church of St Mary’s Maldon was completed in 1130 during the reign of Henry I. The tower itself was built in 1300 and finally fell in 1605 in Stuart times. In 1609 a petition was formed in Maldon and sent to King James I for rebuilding the tower and part of the church. The work was completed in 1636. The white shingled spire we know today was erected in 1740 increasing the height and proving more benefit to mariners in daylight. A great deal of restoration work was carried out during 1867 to 1886 with a massive new roof to the nave in Baltic timber carrying thousands of tiles from the old roof.